Had fun at the party last night, although my liver feels a little abused today. Mostly because after I finished my bottle of wine Corey insisted I switch to his cans of Scotch & Coke instead of going home. I didn't get messy, but I sure did burp a lot. Damn fizzy drinks. I took my camera down to the party, but forgot to put the SD card back in after all my negative scanning yesterday, so I was stuck with my mobile phone as my camera. Hence, Day 94 is a really crappy quality picture of Albie being a goof. 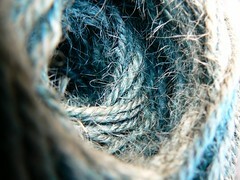 Made up for my camera crapness of yesterday by taking heaps of pics today, including about half a dozen pics of twine. Who knew twine could be so enthralling? Also, for an unknown reason these three planes kept flying in formation over Brunswick, so I grabbed a bunch of shots of them. They're all up at Flickr if you're interested. Clicky the piccie to go see-ey. ... scotch and ... coke? Is that good? It doesn't necessarily sound good. I like those plane silhouettes. Scotch and coke is ... acceptable. Except when it comes in a can. I prefer to not mix spirits with softdrinks, and I especially hate Coke, of all colas it is the nastiest. Everyone at work was teasing me yesterday for being a bogan (um ... kinda trailer trash?) 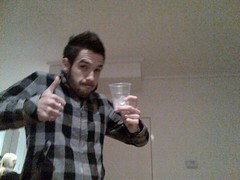 - pre-mixed drinks are the hallmark of bogandom. Thanks! I like them too. 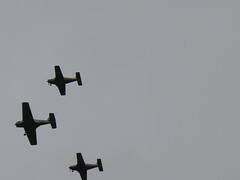 I was happy they kept looping around and flying back over, still in formation, so I could snap quite a few. What with Southeast US liquor laws I don't think we can have pre-mixed drinks in cans - I was in Central America the first time I saw them and thought they were hilarious and possibly sophisticated. So hah opposing cultural stereotypes? Hee hee hee, I can't tell you how much I am laughing at the idea of pre-mix being seen as sophisticated! Ah, vive la difference!